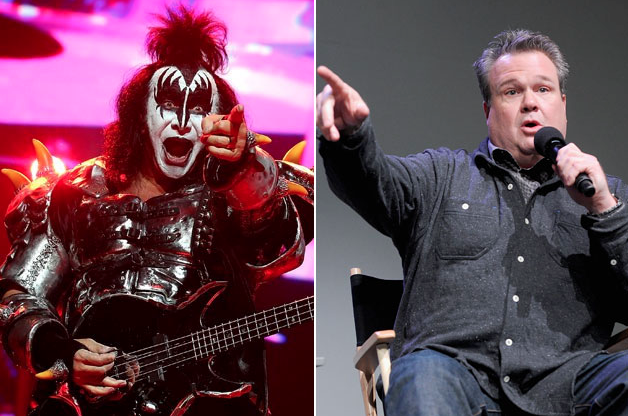 Modern Family star Eric Stonestreet Threatens to handle Kiss rockers Gene Simmons and Paul Stanley after they disrespect him mother. Eric Stonestreet has accused some members of KISS of being rude to his mother Jamey Stonestreet during a recent flight to Kansas City. The "Modern Family" actor took to Instagram on Wednesday, May 28 to share the story. He uploaded a screenshot of his conversation with his mother which read, "I think Gene Simmons is on my flight. DO you think I should give him a kiss?" "Turns out both Gene Simmons AND Paul Stanley were on my mom's flight to Kansas City," the actor wrote in another post. "Gene tried to bully my mom out of her seat and when she said no, he said, it's ok, I just bought the plane and then asked her for HER autograph." Stonestreet also alleged Paul called his mom "Aunt Bee." He ended his rant with, "You should have been nicer to my mom." Simmons and Stanley then took to Twitter to deny the apparent misunderstanding. "Someone posted a story which is blatantly untrue. The essence of it was that we were mean to somebody's mother. It's simply untrue," Simmons wrote. "I actually waited so your mom could get off first. The rest - A misunderstanding of joking. I apologize anyway. Good son," Stanley explained. Stonestreet replied back, "Thank u for that. She did tell me you let her go first. I will tape my glow in the dark Kiss posters back together now." He then added, "OK @genesimmons. Take care. I assure u, I will have a stern talk with my mom about making up stories. Old people, ya know? OUR apologies:)."